What happens to the stuff I send to the archives? Shortly after materials arrive at the archives (as discussed in Part I. 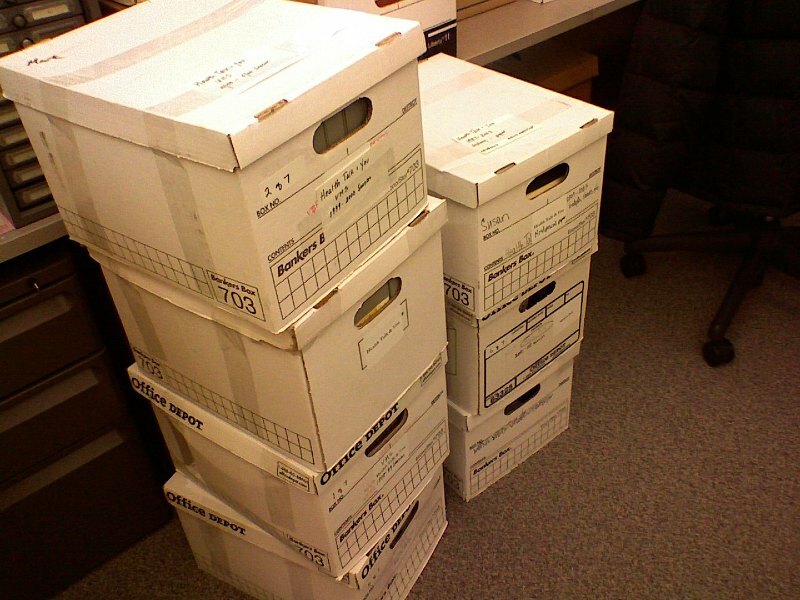 Sending Materials to the Archives), the material will undergo a physical arrangement process. This includes the re-boxing and foldering of material in order to help make it easier to access on an on-going basis as well as help to preserve the items in sturdier, archival quality containers. This is also a time for the archivist to weed out any unnecessary duplicate items or unrelated materials. The level of arrangement that is needed for the collection is often left up to the archivist. Arrangement can include putting loose materials into new folders or re-filing into existing folders, grouping folders on a similar topic into a series, and working with individual documents within a folder. 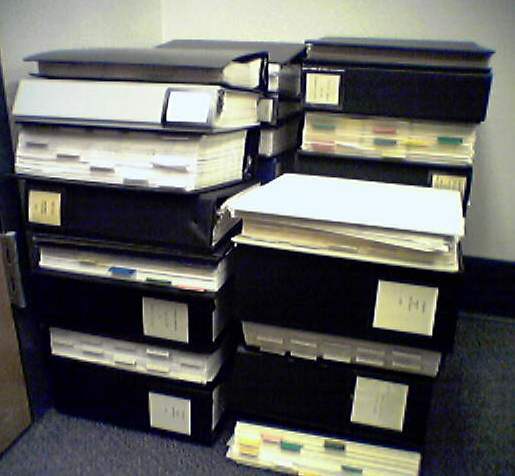 Some prefer an item level arrangement, which places each individual document within each folder in a prescribed order (e.g. chronological, alphabetical, etc.). However, another option is to leave the folders and material in the folders in the same order as they arrived. This saves the archivist time and leaves the materials in the original order that the office or individual created. The initial processing and arrangement of materials can sometimes save space by reducing the total number of boxes needed to store the collection, but not always. The arrangement process did not lessen the number of boxes needed to house the collection. 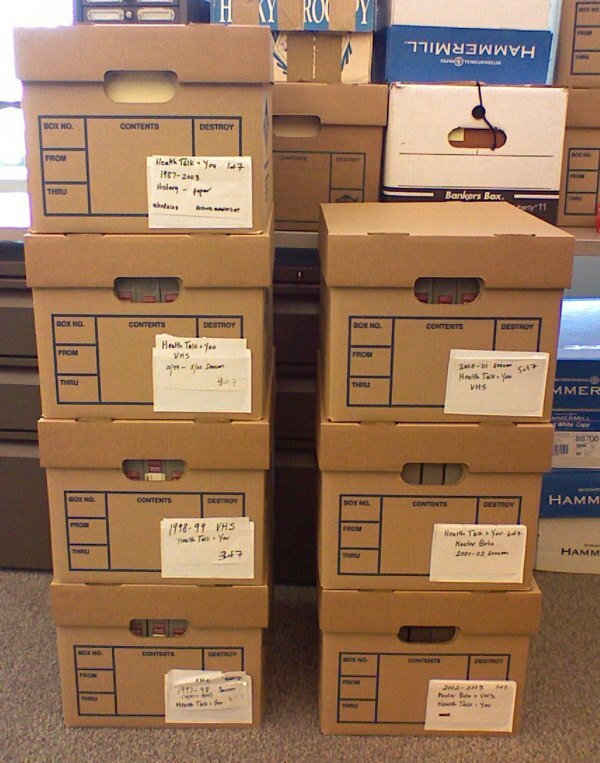 The MPLP method for archival processing states materials should retain their original order at the folder level. It prefers using the existing folders unless the folder is badly worn or damaged. It also does not see the need for the archivist to spend the time sorting individual documents within folders or removing staples or fasteners. This practice was primarily used to help preserve the records from tears and rust from the metal materials; however in a climate controlled environment rust is less of a preservation issue. 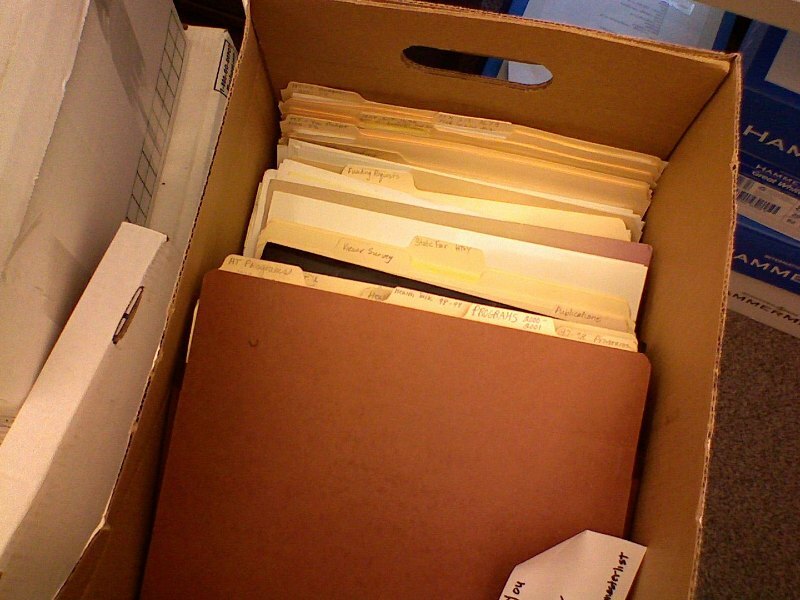 All of the original folders were replaced during the arrangement process, however staples, paper clips and binders were left on the materials. The folders represent the original order of the materials. Part III will look at the description phase that helps researchers learn more about the material. I recently stumbled across the proceedings for the 1993 Conference on Expressions of Caring in Nursing: Exploring Our Environmental Connections (ed. Eleanor Schuster & Carolyn Brown, NY: National League for Nursing Press, 1994). I thumbed through several of the articles for two primary purposes. First, I am enjoying becoming more connected to health sciences literature. It helps me better understand the materials I work with as well as connect to the people I meet. Second, I was curious to see the connections depicted that draw the field of nursing closer to environmental studies. As you may recall, I previously mentioned my own interest in examining archives as a single field among many interested in the long-term use and access to rare and unique resources as is the case in environmental protection. The semantics of ownership and control are present in environmental literature. The shift in language from land management to land stewardship parallels the shift in nursing knowledge from a domain of knowledge ownership to a domain of knowledge growth. In each of the three fields, nursing, environmental protection, and archives, a clear break with past paradigms of ownership and control are made and replaced with growth and partnerships. I find all three suggestions applicable to archives as well. If we document human activities and the broader environment then archivists follow the suggestion of Candace Loewen (Archivaria 33, 1991-92) to be “survival-oriented,” meaning we document “records of value to humans and to the planet as a whole.” Second, archivists are becoming more aware of provenance and appraisal issues at the macro level and are engaging records at their creation, not just at their deposit. A macro level approach is also becoming a part of our processing and description activities. Finally, the third point is again evident in Wurl’s discussion of stewardship of a community’s resources rather than control. So what is the ultimate connection between nursing, environmental protection, and archives? All are primarily interested in the long-term survival and improvement of the communities they serve. And by doing so, cross over to the other fields with a measure of support as well. I am pleased to announce the first major acquisition for the project, the University Hospitals Board of Governors records, 1975-1996. The BoG was established to be the fiscal agent for the University Hospitals. It disbanded after the sale of the hospitals in 1996. The collection consists of minutes for the Board of Governors and planning and finance committee reports. The material is a full run of the Board’s activities and will supplement a previous acquisition by University Archives that documents only activities in the 1980s. The records were delivered to my office in 3-ring binders and await boxing. The collection is approximately 6 linear feet at its acquisition. The binders are all labeled with content and date information. The material is in good condition. No further accruals are expected. When I saw the collection I immediately considered placing the binders into boxes and not foldering the material based on the MPLP method. However, upon closer inspection it would seem that the binders are much larger than the content they hold. By foldering the material, it would condense the collection into 5 or less linear feet. Space considerations, not just staff time, are another area of cost that must be considered. I will update you on my decision once the collection is processed. I had the opportunity to attend the Midwest Archives Conference fall symposium “More Product, Less Process�? (commonly referred to as the MPLP method) held Oct. 6-7 in Omaha, NE. The symposium focused on the major points made in the recent Greene/Meissner article “More Product, Less Process: Revamping Traditional Archival Processing�? in the American Archivist. It also had several guest speakers attesting to the practicality and benefits of minimal processing. In a nutshell, the Greene/Meissner article (see an earlier version) asks archivists to reconsider the status quo of processing benchmarks. They argue that there is no minimum standard practiced in processing as there is in description practices and as such archivists have a hard time determining the level of processing a collection may require. Instead, archivists tend to process all collections to the same granularity and in doing so waste time and resources and add to the ever growing backlog. Greene/Meissner advocate processing all collections to a minimum standard. At that point, the archivist can make further processing decisions based on the condition and use of the collection and the availability of resources. In reality most archives already function with minimally processed collections or provide access to collections that have not been processed at all. Greene/Meissner recognize this practice and are simply advocating that it become a working standard. 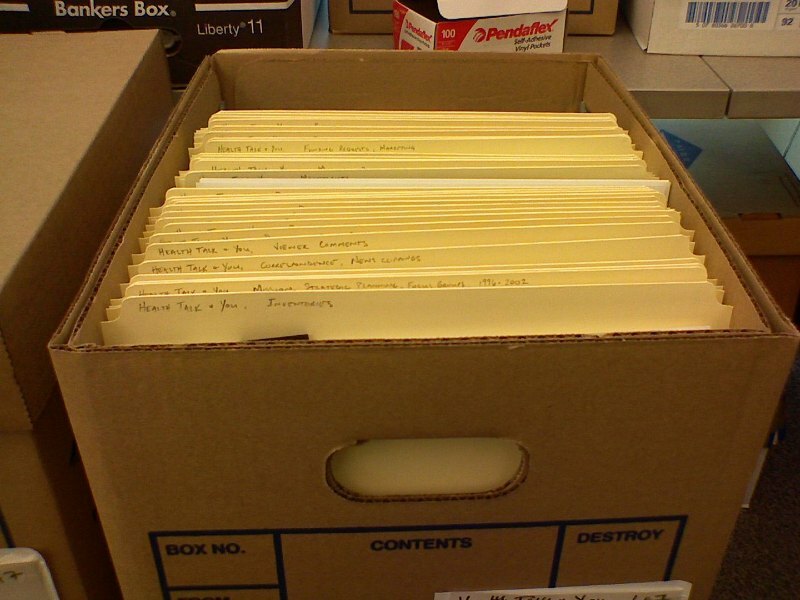 As for the AHC archives project, there are already over 70 collections of papers and records related to the health sciences and the Academic Health Center at the University Archives that are either minimally or formally processed. The project will add to this number by adding accruals to existing collections and bringing in new free standing collections. As the acquisition of new materials begins, processing plans will need to be developed at the time of acquisition. The MPLP method will be a great tool in managing this influx of materials. Stay tuned and I will try to point out the decisions made during the project and how minimal processing works or doesn’t work with specific collection material along the way.